If your hotel offers an in-room safe, you can be relatively sure there’ll be a corresponding fee attached to it. It’s typically just a buck or two, but if you haven’t used the safe, it’s a buck or two less you’ll have for your own coffers. The fee can usually be voided, even if you wait to dispute it until check-out. But be preemptive; ask if there’s a standard Room Safe Fee or Safe Usage Fee when you register and explicitly opt-out. Surely the brainchild of an evil genius, mini-bars are the hotel industry’s version of the grocery store check-out lane. Impulse rules the day. Get ready to be tempted by adult beverages, salty snacks and candy — all with an average markup of 300% over store prices. If the profit margin on this stuff doesn’t ruin your appetite, your bill the next morning will. Tiptoe around the mini-bar minefield by eating regularly, staying hydrated, packing a few snacks of your own, and going to bed early. This is where the true nickels and dimes come into play and hotels rejoice in customer ignorance. It’s difficult to comparison shop on the price of a hotel room if there are fees you didn’t anticipate. Begin to ask standard questions like, “Is a high-speed Internet connection included in the room rate?” and “Do you charge extra for parking?” These two simple questions can help you compare apples to apples and will expose sneaky little profit centers that hotels conveniently forget to mention until the bill is delivered. Here’s most important lesson I’ve learned as a budget-conscious consumer: Within a broad range, individual prices are highly arbitrary. Hotels, like most businesses, have quite a bit of latitude in room pricing and landing at the cheaper end of the range just requires asking the right questions and exercising a bit of fortitude. Test the waters the next time you make a reservation over the phone; it feels less confrontational if you’re new to negotiating. Become familiar with key phrases like, “Is that the best price you can offer?” or “I’m on a very tight budget for this trip; do you have any special discounts I might be able to take advantage of?” Hotels can offer a “walk-out” or “walk-away” rate if they feel like they may lose a customer on price alone. The walk-out price is the lowest price the hotel will let the room go for in order to prevent the customer from — you guessed it — walking out. I’ve even heard of some bold customers ask directly, “What’s your walk-away price?” Keep in mind, it’s harder to negotiate rates during busy nights, peak travel holidays, or early in the day before the hotel can gauge its bookings. Remember, it never hurts to ask. When it comes to hotel real estate, the familiar adage still applies: Location, location, location. The positioning of your room within the hotel can add to or detract from its value considerably. Try to exercise a bit of control over the room you're assigned — I typically try to avoid rooms that are near elevators or staircases, near the ice machine or vending machine, facing the parking lot, or near the main entrance. All of these spots tend to be noisy throughout the night for obvious reasons. Areas near the kitchen or lounge will see a lot activity early in the morning as folks fill up on their complimentary breakfasts. Remember, someone is getting the quietest room. Optimize your chances by knowing the difference between prime hotel real estate and the slums. Since I’m not an early riser, I have a bit of different view of the purpose of a hotel. I like to get a solid night’s rest and not be compelled to wake up early when the housekeeping staff come a-knocking. If a hotel’s value lies in the sheer amount of hours you get to enjoy a little R&R, optimize your time there by checking in early and checking out late. Hotel proprietors will typically let guests check in an hour or two early if there are clean rooms available. Likewise, with a polite call to the front desk in the morning, you can usually score a later check out time. It never hurts to ask and it just might keep you from that mad morning rush. As the economy continues to limp along and businesses begrudgingly adjust to tighter profit margins, their inventiveness will be matched only by their boldness. Vigilance in the new age of “recessionomics” means maximizing the dollars you must spend and closely guarding what’s left. Safe travels...and watch out for the mini-bar! - Travel coupon books are wonderful for those on a budget. You can get one in every state, at a McDonald's, Denny's or a gas station - or if you can find the visitor's bureau in the area you're going to, they should have some there too. The only problem with the coupon books is that for most hotels, you cannot reserve the rooms at the coupon rates; for most places they're on a walk-in basis only. And, if the hotel is close to being sold out or there is a major event in the area, the coupon most likely will not be honored. - If you know someone that is working in a hotel, find out if you can get a friends-and-family rate through them. Most chains offer that. - Be wary of using third-party sites like Orbitz or Priceline, especially if you are prepaying for your room. The cancellation policies for those are really strict, and in some cases, you never know what room or hotel you're going into. And, you're at the mercy of the agency - you can request a nonsmoking room till you're blue in the face, but the site/agency has the option of placing you into a first-available room (which, in some places, is often a smoking room). - Check the ratings for the hotel/s you're interested in. Tripadvisor.com is wonderful for that, and sites like Expedia and Travelocity are offering descriptive ratings for you to look at. View them with an open mind, however - some people/reviewers are just plain mean. I worked in a hotel for four months, and at least at my chain, members of our loyalty program were treated much better than other guests. If you're making a reservation in advance, take the five extra minutes to sign up, even if you never plan on staying with the chain again. Hotel chains try to hook you in by offering points for your stays, but the real reward is the better service you'll receive. Guests in our program were given the better rooms and the management bent over backwards to make sure members' stays were pleasant because any complaints could be taken to the loyalty program, resulting in possible fines for my hotel. Re "Check Out Late," I'm curious to know how you approach a call downstairs that would ensure that you don't get charged extra for the late check-out (or for parking if it's a daily rate that starts/ends at check-out time). Many hospitality workers are trained to say "yeah, we can do that for you" and as long as there's a surcharge that can be tacked on for the request, and you don't bring it up, it's added to the bill. Do you wing it, or do you have ways of suggesting you'd like to check out without added cost? I typically wing it -- I've never been charged an extra fee for staying late (1-2 hours seems to be the threshold for avoiding the fee). Anything beyond that is pushing it. Of course, if it's a very busy day at the hotel, late checkout of any kind may not be possible. I would say late checkout without the fee works about 70% of the time. I don't even look at the hotel phone anymore. I simply use my cell. As you mentioned, the mini-bar is off limits. I've been told that most in-room refrigerators have sensors and if moved, you are billed. Room service is another rip-off. My wife and I bring our own snacks, beer and wine. What some hotels charge for a single beer, I can get a 6 or even 12 pack of. RE_priceline and orbitz..I don't use them personally, as I prefer to deal with the hotel directly. I have friends and family that have had both good and bad experences with them. I agree with one of the comments, definitely become part of a Hotel's Loyalty program, and once you are a member, never hesitate to ask for an upgrade, such as to the concierge level, where a free continental breakfast is usually provided and other small perks. Also, it never hurts to put in your comments that you are traveling for a reason, such as your birthday, anniversary, graduation, etc...These sort of comments usually result in a small gesture such as an upgraded room type, treats from room service, etc... All of the hotel chains focus on guest experiences, and 9 times out of 10 a hotel will help you celebrate whatever reason you are traveling. If you are a frequent traveler to a hotel, get to know the staff! You will always be taken care of if you have a good relationship with the hotel staff, especially the front desk. -Dealing directly with the hotel gives the hotel more money and control. Every website takes a cut and makes any changes nearly impossible. 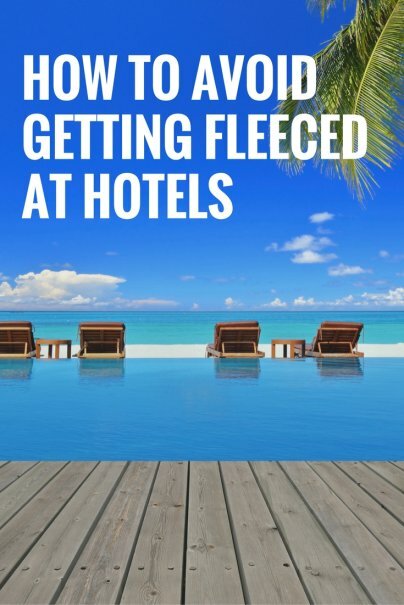 Dealing directly with a hotel makes you a more valuable guest and allows more ability for a hotel to fix problems. -Negotiating can be good but don't be rude about it. The front desk doesn't get paid more if you stay and one troublesome guest is more problems than a hotel full of quiet ones. Be nice to the front desk and they will generally be nice to you. If not politely ask to speak to the owner or manager. If you really want to avoid problems give a tip to the front desk when you check in: you will not have any problems for your stay. So what kind of "tip" would you, as a front desk representative, be expecting?! As a former hotel employee as well---and now frequent guest, I must disagree with that aspect of the advice given. Unless it's a very intimate boutique hotel (where the staff is either related or know each other very well), I would be suspicious if a fellow front desk rep told me to be extra nice to a fellow guest---unless they were also sharing the tip (and it would have to be worth my while to do so---money for a can of pop wouldn't cut it). Now, if there were a value-added service item (such as a restaurant only locals knew about, or time spent detailing local information and/or directions), that would be different, but I'd reward the employee who provided the service directly, and almost never in cash. While we're on the subject, be aware that many attractions and services offer kickbacks for referrals, so don't necessarily believe that the great seafood restaurant you've been told about is necessarily the best one around (especially if you're in, say, Oklahoma or Iowa---far away from fresh sea-anything). I'm amazed at how many times front desk reps have directed locals to the nearest outlet of a chain restaurant in large cities which offer many unique opportunities for dining other than those mentioned to the unfamiliar guest. As previously suggested, be careful about haggling. You can choose a good room or a good rate, but you can't have both; and as an employee I don't get paid any more for giving you a super deal. (In fact, I can get in trouble for giving away the store, as it lowers the average daily revenue figure, which many larger properties use to determine management bonuses.) Just like you can't expect to pay $2.99/pound for lobster, neither can you get a primo room for a rock bottom rate. If you want cheap, be prepared to stay on the nosebleed floors with an excellent view of the other wing of the hotel, or the parking lot facing the highway. If you're looking for the best rate, use your membership discounts. The AAA rate is one of the best overall discounts, and many chains partner with AAA to offer special deals various times throughout the year. (But don't claim a AAA discount unless you can prove you're a member---some hotels instruct their staff to verify eligibility, especially when the hotel might otherwise sell out to higher-paying customers.) Other membership discounts to try are Sam's Club or Costco---or see if there are promotions for using a specific credit card (VISA, MasterCard, and AmEx offer various discounts for cardholders at various chains at various times). Most importantly, do your research and know where you are staying. Often, if there are cheap rooms for the general public at a particular property, there is a reason. The good news is that it might be because it's a business-oriented property and weekends are dead (which makes the deals for those days lively). The bad news is because it might be in an area which is in decay and/or has a high crime rate (and those in the know don't want to stay there)---or the hotel itself is long in the tooth and in dire need of remodeling [read: dumpy]. In one US city of my acquaintance, there are a number of airport hotels located off a busy street with easy access (and escape) which are easy picking for car thieves and auto burglaries. Only there's no "crime wave" discount, since it is near the airport and lodging is always in high demand. In the same vein, if you have to stay downtown or in an area "where the action is", you will also pay for that 'amenity'---if not in the room rate itself, than in parking, or other previously mentioned fees. Also be aware of what else is going on in the area while you are there. If there is a major convention, seasonal or special event, rooms will be scarce and not inexpensive. The hotel I was working at was in a city subject to a papal visit and as soon as the visit was confirmed, we were taking reservations for the time frame in question at 400% above our average rate, with a 3-night minimum---full pre-payment required. In many areas with such events, hotels in places 1-2 hours away will also fill up and be far above average. Decent hotel rates can be had, but you have to be realistic and be willing to work a little for them. I worked for a hotel internet provider, and you had to accept the charge before using the service. It's amazing the lies people could come up with to remove a $7 charge from their credit card.